Phew! It's hot here! I never feel like I have the right to moan when it is cold because our version of cold is not very cold at all compared to what some parts of the world experience and we certainly never end up with blizzards and the like, but we are up there in terms of heat so I will say it again.... it's hot here! I do think I am justified though. I am in Adelaide at the moment, rather than in Melbourne where I live, and it is going to be a very warm 42 degrees Celsius (that is 108 Fahrenheit). It's still good reading weather though, as long as the aircon is on and you don't have to go outside. The Little Russian by Susan Sherman - Nicole from Linus' Blanket was telling me about this book and it sounded so good! The Hypnotist's Love Story by Liane Moriarty - I've read the other two Moriarty sisters and now it is time to try the other Moriarty sister. 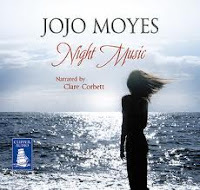 Night Music by Jojo Moyes - I have loved Jojo Moyes recent books. I was looking for a new audiobook to listen to and noticed that my library has this one so I will be giving another one of her earlier books a go! 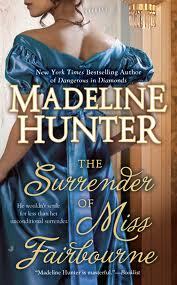 The Surrender of Miss Fairbourne by Madeline Hunter - I generally enjoy Madeline Hunter's books. This is the first book in a new series. A Lady by Midnight by Tessa Dare - I do enjoy Tessa Dare's books and I am sure this will be no exception. Head over to Clare's blog to share your Library Loot link! Oh my goodness, that is hot! But, as you say, it's perfect weather for staying indoors, near the air conditioner, with many books to hand. Enjoy yout loot! I am not planning on going anywhere today I assure you! Wow, I think that's hot. Stay cool and enjoy your loot. I wasn't as taken with the last series she did but we will see how this one goes. Ooh, I can't wait to see what you think of the Tessa Dare. I adored it. I have enjoyed all her books so far and I expect this one to be no different! I so want to read The Little Russian, and think that I am going to buy it on my Kindle this evening. It's such a great premise, and I have heard nothing but good things about it so far. I am so glad that you got it, Marg! I can't wait to hear what you think! That's way HOT. Melting pavement kind of hot! Is it humid, too or just dry heat? All of your loot looks great, although naturally I'm most curious about the romances. I need to catch up on Tessa Dare's latest series. I've only read the prequel novella! Some days humid, other days not! Wow- that is hot! I love hot weather though...so sick of winter here! All of your books look great! I am especially interested in NIght Music- love that cover! Enjoy all of your books! 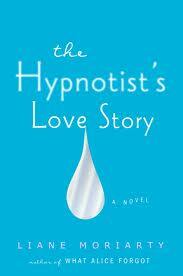 I hope you enjoy the Hypnotist's Love Story as much as I did! The Little Russian by Susan Sherman sounds so good and I love the stark cover! It does sound good doesn't it! I didn't realize that JoJo Moyes has written so many books. Somewhere else I saw that she has 9. I loved her last book, so I will be giving some others a try. I've read four now and liked them all. The last three have all been excellent though.